This is my first attempt at a colour challenge. 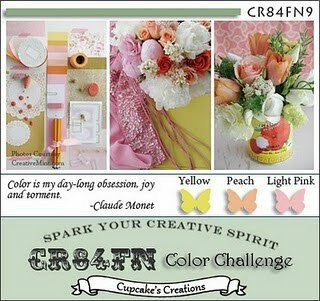 Yellow ,Peach and Pale pink. Inks: Memento and Su pens Pretty in pink,Cameo coral,Barely Banana,gable green,yoyo yellow and creamy Caramel. Other: Spellbinder die ,SU punch and PTI large Scallop die. Michelle - this is such a cute baby card. I really like the border details and the cute buttons. Thanks for playing along with CR84FN. Such a cute baby card, wonderful design. Thanks for playing at CR84FN! Awe, what a sweet baby card Michelle! What fun trim! Thanks for playing with CR84FN! I just love your layered scallops, what a great idea!! Thanks for joining CR84FN this week! This is just a positively adorable baby card!!! How fantastic are those scallops?!?! Love it! Great job with the colors! Thanks for playing with us at CR84FN! Hope you'll play along again! Michelle, Michelle! You HAVE to play in more of our color challenges! LOVE your baby images and the scallops and ribbon and buttons are WONDERFUL! THX for playing with us at CR84FN! This is just darling, Michelle! You did a wonderful job with your first color challenge! Thanks for joining us at CR84FN! Great card Michelle, the pram stamp is so cute and I love the large scallops.